Authentic NATURE STONE® Brand Flooring is a blend of natural stone and specially formulated epoxy designed to be applied as a resurfacing/flooring material over an existing, structurally sound, concrete substrate. The substrate condition is critical to a successful NATURE STONE® Brand Flooring application, as any shifting, heaving, settling, cracking or deterioration of the substrate can result in damage to your NATURE STONE® Brand Flooring. Authentic NATURE STONE® Brand Flooring is a porous product allowing dampness/moisture to breathe through and is not intended as a waterproofing product. Authentic NATURE STONE® Brand Flooring will not redirect water to run off. The thickness of NATURE STONE® Brand Flooring can be adjusted and can be useful in correcting uneven substrate surfaces, however, Authentic NATURE STONE® Brand Flooring is not intended as a leveling product and unless specifically noted, Authentic NATURE STONE® Brand Flooring is usually applied an average of ½" to ¾" in thickness, following the contour of the existing substrate. The Authentic NATURE STONE® Brand Flooring application may require all adjacent doors, including garage doors, to be adjusted by the property owner. After the completed application, some shedding of loose stone is normal and should be expected. Excessive or continuous shedding mandates immediate contact with your Authentic NATURE STONE® Brand Flooring Customer Service Representative. As with any natural product, Authentic NATURE STONE® Brand Flooring can be affected by exposure to ultra violet light and wearing patterns. Discoloration from UV light will vary depending upon the original NATURE STONE flooring color chosen and the amount of UV exposure. Light colored stones are more affected than dark stones, and are not recommended for outdoor use. Wearing patterns may also affect the NATURE STONE® Brand Flooring color and light reflectivity. All stones are natural in color; we cannot be responsible for color variations. Authentic NATURE STONE® Brand Flooring is a hand troweled product, and although every effort is made to ensure a perfect surface, some imperfections such as an occasional upturned pebble or slight trowel mark may occur and should be anticipated. In certain conditions, white deposits can sometimes appear on your NATURE STONE® Brand Flooring. These deposits can be caused by efflorescent salts present in your concrete substrate, moisture in your substrate, enough pressure to move salts to the surface. We occasionally see this condition on concrete, but it is much more noticeable on a beautiful NATURE STONE® Brand Flooring surface, even though Authentic NATURE STONE® Brand Flooring is not responsible for the condition. This deposit will commonly disappear with normal weathering. Following the care and maintenance guidelines should provide you long-lasting durability and beauty for your Authentic NATURE STONE® Brand Flooring. The care and maintenance annual inspections are offered at no charge and are strongly recommended. Periodic cleaning and re-glazing/top coat are recommended to maintain the beauty and integrity of Authentic NATURE STONE® Brand Flooring. Stay off NATURE STONE® Brand Flooring (new or re-glazed) until it is completely dry. Exterior stone flooring from NATURE STONE® Brand Flooring can be hosed down or pressure washed. Do not allow solvents such as paint thinners, Xylene, MEK, caustics, and Muriatic Acid to come in contact with Authentic NATURE STONE® Brand Flooring. In case of contact, flush thoroughly with water. Avoid weight exceeding 8,000 pounds per square inch. 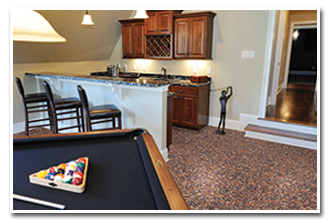 Interior NATURE STONE® Brand Flooring such as basements may be cleaned by sweeping, washing, hosing, vacuuming, wet-dry shop vacuuming, floor scrubbing, deep extraction cleaning, or utilizing a carpet cleaning machine as necessary. A light scrubbing with an approved mild degreaser or detergent as necessary is acceptable. Re-glaze Authentic NATURE STONE® Brand Flooring with an approved sealer when shine begins to fade or becomes dull. Clean Authentic NATURE STONE® Brand Flooring thoroughly and allow flooring to dry completely before re-glazing.